The kit was an easy choice for me, in fact a no brainer. I am not planning to put this gorgeous car into Concourse shows and never drive it as I might get dust on the rear axle. I want to enjoy this car and make it as reliable as possible. I will of course drive it to classic shows and take the flack from the anoraks who say it’s not original. I don’t care to be honest. It will be my weekend hobby, drive her around without the spare set of points and a set of feeler gauges in my pocket and wondering if the ballast connector is ok! The kit was made up of three parts. 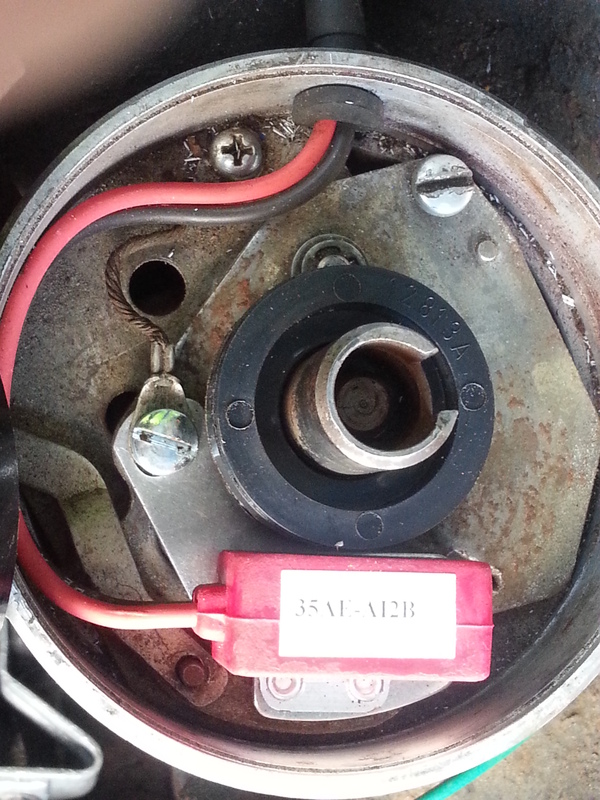 The leads, the coil and the electronic ignition. 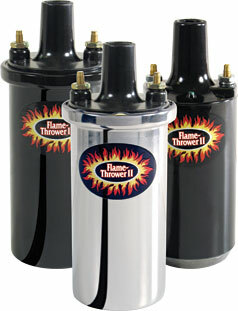 P/N – 45001 – Chrome Flame Thrower II, low resistance 0.6ohm coil 45,000 volts. The Coil – A double single page of A5. It does the job and is helpful to explain that if a Ballast resister is in place and you are using a Ignitor II coil it can be removed and explains how. The instructions also points out that you may open the points a little from the stock settings for a more performance related and aggressive spark which is available due to the increased voltage delivered. No diagrams but then there is only the Positive, Negative and tower connections to deal with. In the Box – there is the Coil itself, Instructions, and small packet of terminal connections. The Leads – A double sided single page of A5. This is an easy to follow step by step with clear diagrams. There are multiple options for the connections and you choose what fits your set up at the time. The instructions mention the use of a spark plug crimping tool. This is not mentioned on the box and is really an additional purchase to do a good job. You could always use various sets of pliers if your brave enough. In the box – Nine 8mm leads of various lengths in pairs. 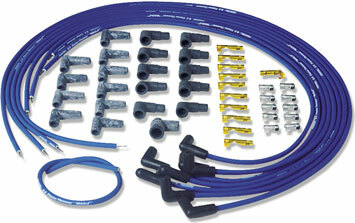 The leads range from long, to medium, to the distributer / coil lead. The bag of rubber boots are generous allowing for a right angle look, 45deg look (which I went for), and the standard distributer boots. The coil lead features a single upright option instead of the 90deg depending on where you want the coil to sit. The leads are blue in my case with Petronix branding on the leads. I suspect that as the leads are silicon, the writing could be rubbed of if you wanted with a little mild cleaner and elbow grease. The length is more than enough to custom route the wires and have plenty to spare. I had about 2ft left on the furthest away cylinder (number 4) thats even after cutting with a generous amount to spare. In fact it could have been a little shorter in hind sight! The Ignitor II – This is an A4 folded into thirds, advert for the other 2 components I am using here, Questions and Answers, wiring instructions and 3 diagrams for various stock set ups: the original set up (for comparison), and the other two are with and without the Ballast Resistor in place. In the box – There is there is the points sensor, the black distributer shaft collar, a screw and the plastic feeler gauge which sets to 0.030″. I found this small piece of clear plastic a bit burred on use so I swapped it for my faithful set of feeler gauges to the same gap. I will address the fitting as I went along and in the order that I did it. Firstly my original coil was mounted on the Right side of the block (LEFT as you look at it from the front to back of car). Americans always address their left and rights from the driver’s seat of the vehicle facing forward. It took me a little while to get it but makes sense! I moved it over as it was behind my dipstick and I had lots of space the other side. The space is due to the AirCon that I will not install back yet (or if at all). If I get hot I will use the old school manual AirCon, the funny handle that you turn and the window goes down. It’s also an excuse to hear the menace of the v8 thundering away as well. I digress, back to installation. 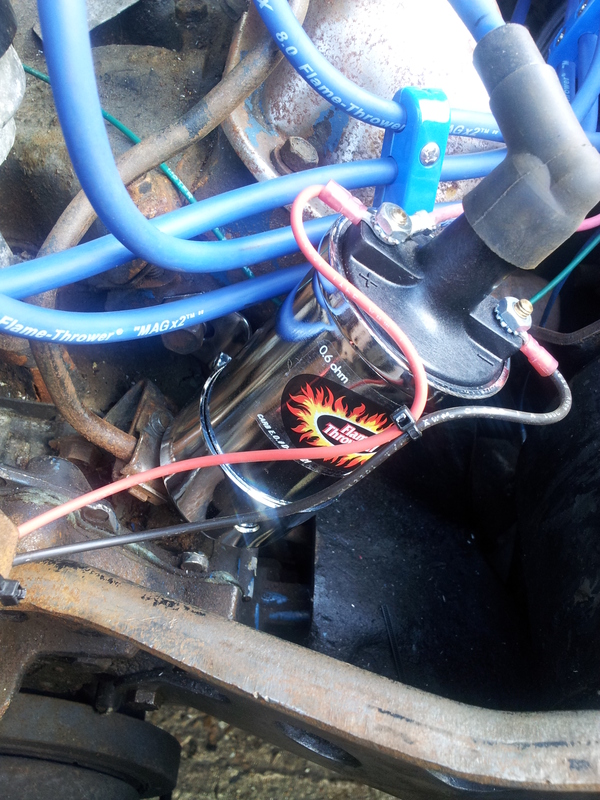 The chrome coil was an exact replacement of the original, the coil fitted in the clamp no problem. 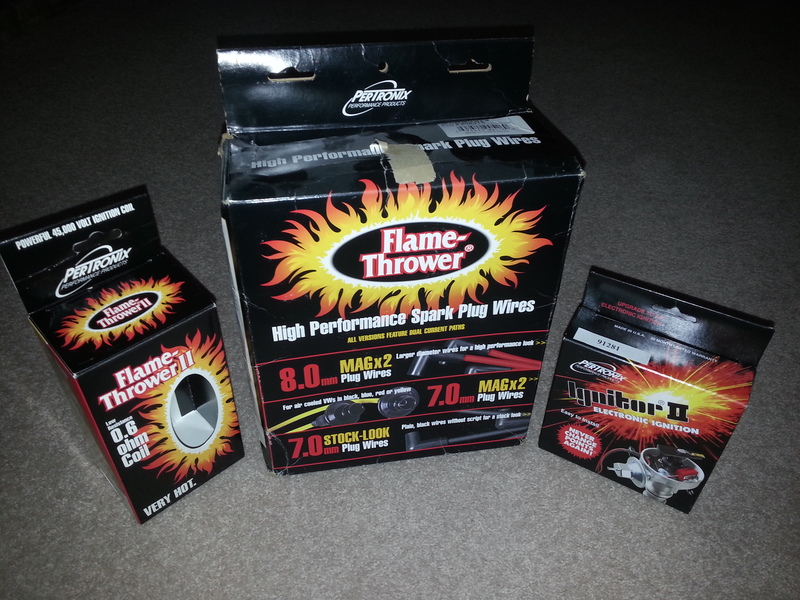 On the front of the coil there is a clear plastic sticker of the Flame Thrower II logo. This sticker is exactly parallel to the terminals above, nice touch to see the logo and the terminals together. Looks neat and tidy. Ok with the coil in place there are no connections at all at this point. I decided to fit the Ignitor II. Removed the distributor cap and the rotor arm, the negative lead and the condenser. The wires here were brittle and the faces of the points were pitted. This was where my first and only issue relating to the product arose. 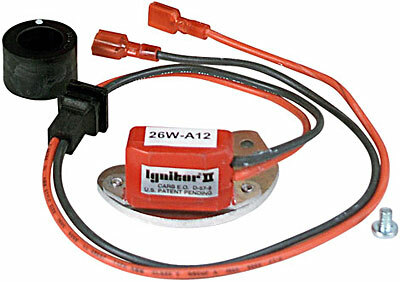 The wires from the Ignitor II are pre crimped with terminals that go straight to the coil. Labeled as Black-Negative and Red-Positive. The coil has the corresponding markings in place. My problem was that I could not thread the connections through the side of the original distributer unit. To get round this is deployed the cordless drill and a varying set of drill bits to open very carefully the whole. Now I do hear you say, cut the crimps and redo them. Agreed, if I could get as nice looking ones at the time, also the rubber grommet supplied with the unit did not fit in the original hole either as the original hole was to small. I wanted a nice tight seal and as much stock look and fit as possible. I don’t like the horrible blue, red or yellow Halfords specials, they just looks rubbish on a polished chrome coil. A couple of carefull attempts later the aluminium coil case was opened enough to tread the leads through and fit the grommet in place. Note: If you are to drill, make sure no swarf is getting into the distributer! I now seated the sensor unit onto the base plate and located by the pre drilled lugs and pins. I then screwed very lightly into a wide open position. I inserted the magnetic collar on the shaft and slight twist to locate in place and it snapped down into place. The collar is circular. So to gap this properly there is no need to put the car in gear or crank over by hand to get the high point of the shaft lobe. Take the feeler gauges which have been set to the 0.030″, place between the collar and sensor and move the sensor into place. Once the gap has been set, tighten the locking nut. 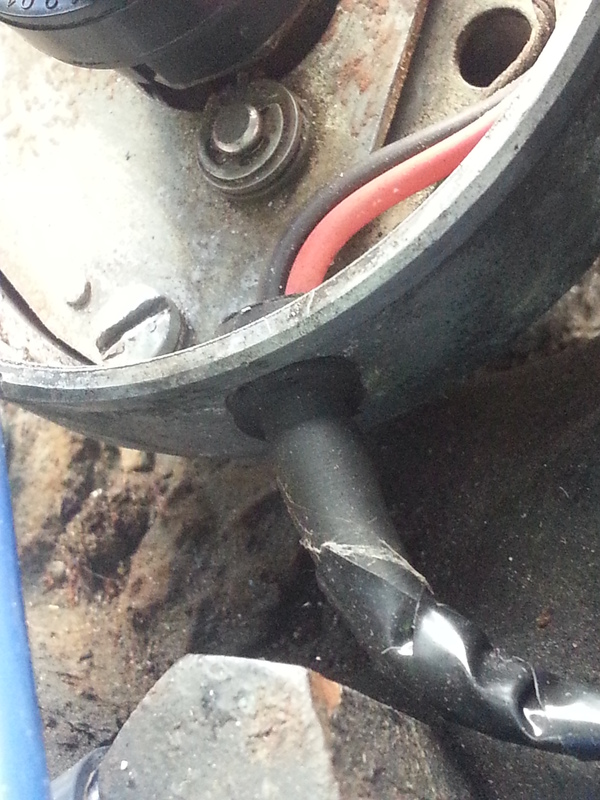 I then re-connected the earth lead from the base plate and then replaced the rotor arm. Total time – 45 mins with drilling and set up. Leads, now this was it was tricky for me – I had none in place! So I had a blank canvas to route them where I wanted. I decided to go for the lay across the rocker cover look. 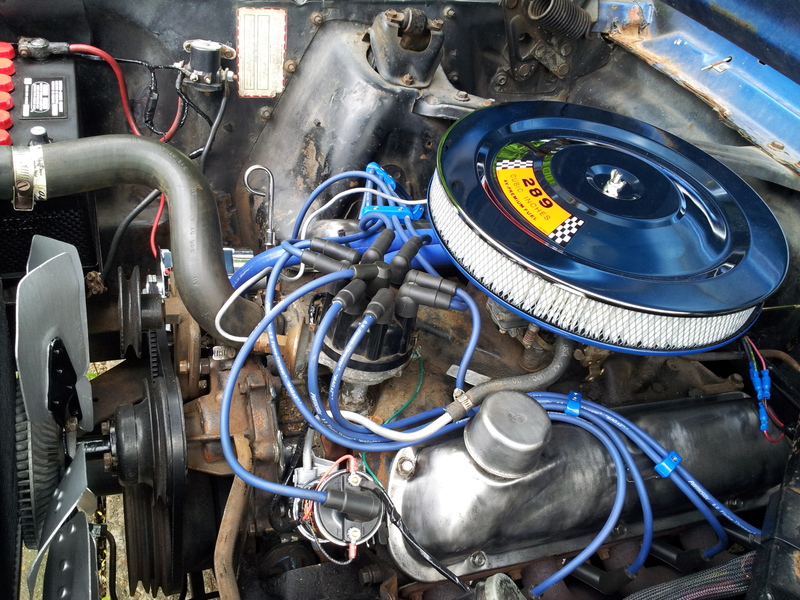 I am going to replace the rockers with chrome polished ones anyway and the blue will look good against it. I measured the wires and marked them up where I wanted them to go leaving a couple of inches extra just in case of mishaps. Cut them short and make a mess and you have lost the lead potentially if there is no slack. Anyway, to cut a long story short I had the leads made up for me with the proper crimps for the connections where I marked them up. They arrived back and they looked the part. I plugged the cables into the distributer and laid the cables out according to the cylinder numbers I had tagged them with before I sent them away. Haynes Manual here (see book review) was invaluable. I have now attached some photo’s here of the the post fitting. Since the fitting of the kit I have taken the sticker of the coil as I wanted a natural polished look. To finish it all of, I got some black insulating tape and wrapped the wires for a more stock look. I hope this helps a little or gives you an idea for a flash looking and reliable upgrade. I’m going to replace my points with ignitor 2 and coil as well. I will use the same setup as you, but my seller told me that I need to feed my coil constantly with a 12v line. I don’t see that in your setup. Do you know more about this? Slightly worrying that you have a full 12v live to the coil. I replaced my complete loom with the AAW setup and they recommend a 1 wire alternator and nor through the voltage regulator. The petronix does require a good 12v to make it work, perhaps that’s what he means. Oh tip for you: open the plug gaps a fraction to allow a good full spark 40thou. Otherwise the coil gets hot and misfires after a few minutes. I’ve been researching proper plug wire routing and found your page, one thing I have found is clear discussion on keeping #7 & #8 plug wires separated as they are routed. Apparently Ford even issued a TSB (technical service bulletin) regarding this as it can create misfire issues in #8 and left unattended can result in internal engine damage. Just thought I’d pass this along as it appears in your pic that you have them routed together. Thank you very much Rob for taking time out to comment, the HT leads will be different from that configuration now as they will be remade for the new look. You have certainly caught my attention and I will look into it.